Last week the Big Apple had a big visitor. Kai Lenny! For those who are unfamiliar with Kai, he is a professional surfer from Hawaii. He is without question one of the most talented surfers on the planet. He is best known for his big wave prowess, however Kai excels in just about any and every form of board riding. He is the quintessential waterman. Kai was in town with another supremely talented big wave surfer and photographer, Derek Dunfee. Derek just released a new big wave zine featuring Kai called DEKKA KAI, and their first stop on their tour was New York! Unfortunately I wasn't able to make the release event, but the next day they had a follow up event. Kai Lenny, Derek Dunfee, and local big wave pro Will Skudin would be out surfing in Rockaway with anyone and everyone who wanted to come by. I couldn't miss the chance to be in the water with three of the best big wave surfers in the world, so I was there to shoot. It was an awesome time hanging out with these guys, who were all super down to earth and really cool. Thanks to Hurley Surf Club NY for putting the event on! When I decided to try my hand as a surf photographer, it was spent standing on the beach with my camera taking pictures of the surfers who were out. I detailed that first time in my last blog post. That first time went well, however my second time shooting wasn't as good. We were forecasted to have some fun waves, so I headed to my favorite break in Panama City Beach; St. Andrew's State Park. I spent the afternoon sitting on the beach, shooting pictures of all my friends out in the water having fun. But something was missing. As I sat there taking pictures, I felt left out. I grew up surfing, swimming, and just being in the water any chance I got. I realized that sitting on the beach wasn't going to cut it. If I was going to get into surf photography, it would have to be by shooting in the water. That night when I got home, I hopped on my computer to figure out how can I bring my camera in the water? I was still shooting with a Nikon P510, but I couldn't find any water proof housings for that model. I would have had to buy a new camera, one that they did make a housing for, and then buy the housing! It was not a cheap endeavor. Besides, this was just a new hobby that I didn't even know if I was good at. My next option? My iPhone. I already knew they made water proof cases for iPhones. So the next day, I excitedly went to the Verizon store and bought a Lifeproof case, with the bright orange lifejacket that went around it just in case the wrist strap came off. I was so pumped to try shooting in the water, as soon as I bought the case I immediately went back to the beach. The swell had already come and gone, and the beach was empty. But I was too excited. So I hopped on my surfboard and paddled out myself, with my iPhone. I'm not really sure what I was thinking I was going to be able to shoot sitting out there by myself, but I just had to get out there and play around with my new setup. I paddled out, and just laid on the board enjoying the sunset and took a couple shots. Turns out, one of the very first images I ever took in the water would be pretty good, and still to this day is many people's favorite image I've taken to date. Have a good weekend, cheers! Go check out the new piece I wrote for The Inertia! In my last blog post I discussed what first got me interested in photography. In this post, I'll rehash a pretty funny story about how I was basically forced to create a photography page and start to take my hobby semi seriously. A few months after I first got interested in photography, I decided I should merge it with another passion of mine; surfing. Why it took months for it to dawn on me I should try surf photography, I have no clue. When it did finally click, there was an upcoming surf competition in Panama City Beach called the Mr. Surf's Cold Water Classic. As an aside, being a New Yorker who grew up surfing in snow storms, I found it amusing that Floridians had a competition called the Cold Water Classic. But to be fair, the water was cool enough you needed a wetsuit, so I'll give them that. I decided this competition would be a great opportunity to try my hand at surf photography. It was just down the street from my house, so why not. I walked down to the beach, took pictures for a little while, and went back home to see what I caught. At the time I was still using my Nikon P510, and only had the Nikon editing software that came with your camera when you bought it. I didn't know the first thing about editing. Color correction, white balance, exposure, highlights, etc. were all completely foreign terms to me. I basically just played with the editing tools and just eyeballed it. Whatever I thought looked good, I went with. And I had one shot that I was pretty happy with. This shot of Matt Zimmer in Panama City Beach, FL is the shot that really started everything for me. This was my best shot of the day. I had a handful of others that turned out okay, but I was pretty stoked with this. So I sent the picture to the owner of Mr. Surf's Surf Shop who hosted the competition, Tony Johnson aka 'Mr. Surfs'. I basically said "Hey Tony, I caught a good shot at the comp today, check it out!" Well Tony liked it also, and he posted it on Facebook . But what he said with the image was "Great shot from today. Rich Brooks has a bunch of professional shots from today's competition, go check them out!" That was nice of Tony. The only problem was, I didn't! I didn't have a bunch of shots, and I certainly didn't have a photography page! I only had my personal page with all the security settings that no one would've been able to find me. So I spent that Saturday and Saturday night editing a handful of pictures so I at least had something to post, and then figuring out how to create a Facebook page for my photography. And that's the time I was accidentally forced to create a photography page. Hope everyone has a great week. Cheers! I thought the most appropriate topic to first get into on the blog would be how this whole thing even began. I moved to Panama City Beach, FL in the spring of 2012. I was still in the Navy at the time, and somehow hit the billet jackpot and was assigned to be the Port Operations Officer in the beautiful spring break capital of the world. The spring break piece actually wasn't as bad as anticipated, but the landscape was also much more beautiful than I had anticipated. I had never been to the Gulf Coast before I moved there, and I was blown away. White sandy beaches and clear turquoise water, it was like I moved to the Caribbean. Add in the fact that PCB is also situated on a little piece of land sticking out from the panhandle of Florida so that it actually faces a little to the west, so the sun sets over the water. Basically, it was probably the prettiest place I've ever lived. This was the first picture I took on my first trip to the beach, with my iPhone. I was never interested in photography, or any form of art for that matter. I had a bad art teacher when I was a kid, and I hated art for years. Fast forward a bunch of years, and at 26 years old armed with all this new technology like camera phones and Instagram, I realized I had an interest in photography. But it was really the landscape of Panama City Beach that peaked my interest, and after a few months of living there I decided I wanted to start capturing the gorgeous landscape of my new home. My mom bought me my first camera as an early Christmas gift (thanks Mom! ); a Nikon P510 ultrazoom. I have owned point and shoots before when I was younger, but this is what I consider to really be my first camera. So that's where this all started. A beautiful new town, and a Nikon P510. And in the next blog post, I'll tell you how I was accidentally forced to start taking surf photography seriously. It's an amusing story. It's been awhile since I blogged on my site. Only a few years. But I've decided to pick it back up because the big news recently is I decided to go full time with my photography! I went to Iceland last December for a photo workshop with Chris Burkard, and a handful of other photographers. My goal on that trip was not only to learn as much as I could from Chris, but to truly immerse myself in photography and give a lot of thought to if I wanted to do this for a living. Needless to say, here I am today. It took a few months of thinking after that trip to really build up the courage to leave my job and guaranteed paycheck. But here we are! 1. To work on my writing. I've come to learn that crafting words to go along with my images is a pretty important piece of the overall puzzle. 2. As a way to record this crazy, scary journey So HOPEFULLY one day when I've become successful enough to make a good living, I can look back at the process. 3. Holding myself accountable to getting out to shoot as often as possible. My goal is to create a new blog post every day. Some days will be discussing the process of starting my business, other days it will be featuring one particular image and the story behind it. Hope you guys enjoy and follow along! So if you follow me on Facebook, you know that things have been pretty busy lately! In the past few months I had two pieces published by The Inertia, I was selected to be a 'Local Pro Photographer' for Surfline, and most recently I was lucky enough to be selected to take part in a photography workshop being put on by Chris Burkard at the Florida Surf Film Festival. I am super excited about being able to go to this workshop. Chris Burkard is one of my top 3 favorite photographers out there, along with Clark Little and Morgan Maassen (you should all go check out their work if you haven't before). He is a 28 year old, self-taught photographer who loves to travel and capture stunning landscapes in addition to surfing. I have a style that is a little like his, except that I enjoy being in Florida, and he is often in frigid location such as Antarctica and Iceland. In our own ways, we both tie surfing in to the bigger picture of the surrounding world. 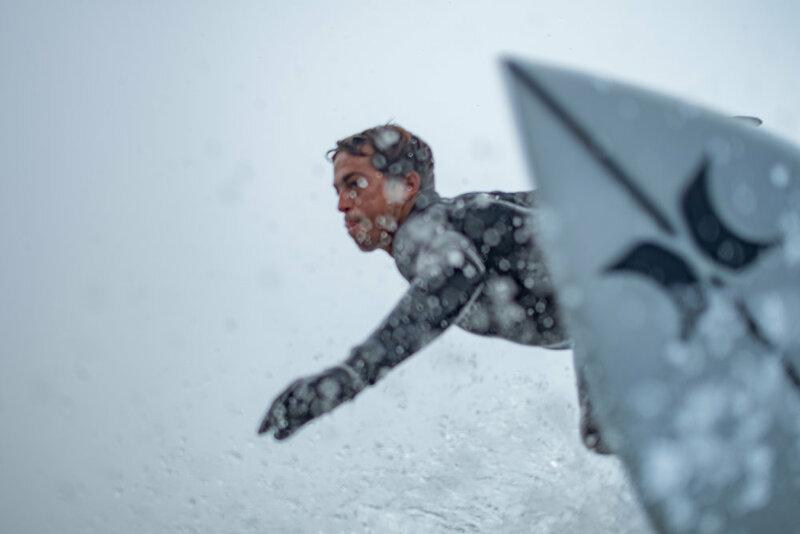 The focus isn't just what the surfer is doing, but where he is doing it. Surfing is a sport that interacts with Mother Nature unlike any other sport in the world, and that is always something that I enjoy capturing in my images. I can't wait for this workshop so I can learn from one of the best! Here's a video that was recently finished about one of Chris's trips. It will give you a taste of what he goes through, and show you some of his breathtaking work. Hey everyone! Thanks for stopping by to check out my website. It is a brand new website, so I'm still putting the final touches on it, so please bear with me while I finish building it! I don't have anything up in the store just yet because I am still learning how to run it. However, that doesn't mean that you can't purchase any products. If you are interested in any prints, canvases, etc. please just shoot me an email! My email address is Rich.Brooks441@gmail.com, or just click the email link on the home page. There are also links to my Facebook page, and my Instagram, feel free to go like/follow me. Thanks again for stopping by my site, and come back soon!